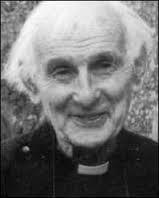 As well as his role as Chaplain of the Julian Shrine in Norwich, Robert was a writer, spiritual director, and speaker. He also had a profound pastoral ministry: people would come from the local area, other parts of the country and from all over the world to see him for fellowship, advice and to share silence with him. Many of his books about the wisdom and teachings of Lady Julian of Norwich are now regarded as spiritual classics, full "of devotional richness and theological insight". ​Also available is a DVD entitled "Love Was His Meaning" which was made after his death to celebrate his life. It includes interviews with twenty eight of his friends talking about the positive influence Robert had made on their lives. Their words sing of a life lived in love.